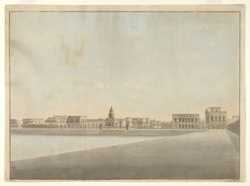 Handcoloured etching with aquatint of the east side of Tank Square in Calcutta by William Baillie (1752/3-1799) plate 12 of his 'Twelve views of Calcutta' published in 1794. Tank Square, later Dalhousie Square and now BBD Bagh, lies at the centre of the area once covered by the original Fort William. A large tank in the centre of the square was constructed in 1712 in order to provide water storage for the city. The headquarters of the East India Company known as the Writer's Building is located on the north side of the square. The church in the centre of this view is most likely the Swedish Mission Church built in 1770.